Shipping fine art is usually related to a number of specific challenges, such as an abundance of rare shapes, forms, and sizes of the artworks or exceptional fragility of the transported items (for example, a delicate glass object or a complex metal item requiring professional care). Besides, not every auction house or gallery specializing in contemporary and modern art provides its clients with free artwork shipping services accompanying a purchase decision. 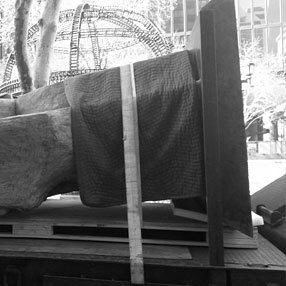 However, finding a professional fine art moving and shipping company knowing exactly how to handle modern art pieces in regard to their rarity and complexity is also quite a challenge. As a result, happy owners of recently acquired pieces of modern and contemporary art often face a problem of selecting responsible art shippers providing white glove art courier services professionally. Even if you have bought small pieces of canvas art, such as oil paintings or modern abstract art, you still may experience certain hardships with their local or international transportation, not to mention complex glass or metal objects that require professional art packing and manufacture of custom crates. It goes without saying that this job cannot be done by regular movers. Only experienced art handlers specializing in artwork shipping can ensure that all your precious art pieces are delivered to wherever they need to be intact. Hence, if you want your modern abstract art, paintings, wall art, sculptures, or any other valuables to be shipped with care and professionalism, you have to think carefully about the reputation and attitude of art shippers you are going to hire. Plus, do not forget about art insurance that is also an integral part of the safe and secure artwork shipping process. 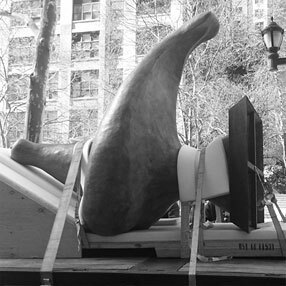 At Fine Art Shippers, we value any piece of contemporary or modern art we are entrusted to transport, paying special attention to every single step of the moving process. We know that whether it comes to oil paintings, sculptures, or anything in between, each item is unique and should be handled with respect and the utmost care. Moreover, artwork shipping is not only our job but also our passion, so you can entrust our team of art shippers to move even the most exquisite and fragile piece of art, knowing that it is in the careful and expert hands. In other words, Fine Art Shippers is the right place to come for help if you want your new acquisitions to be delivered in their perfect condition!